Living in Spitalfields, an area of London defined by its markets, I am constantly aware of the traders and the ever-changing drama of street life in which they are the star performers that draw the crowds. Interviewing the market traders in Spitalfields has taught me that although they are here to make a living, it is an endeavour which may be described as culture as much as it is commerce. In fact, the markets prove so engaging to some as a location of social exchange that they carry on coming for the sake of it, even if they are not making any money. This fascination of mine with the culture and performance of market places has led me to delight in the diverse sets of the Cries Of London for the pictures they give of street traders in the capital down through the ages. Even though they were frequently sentimentalised, these portraits also reveal the affection with which Londoners held the traders, celebrating the ingenuity of the identities created by vendors and casting them as the celebrities of the thoroughfare – collectively expressive of the very personality of the city itself, when the streets were full of people with wares of every description to sell. 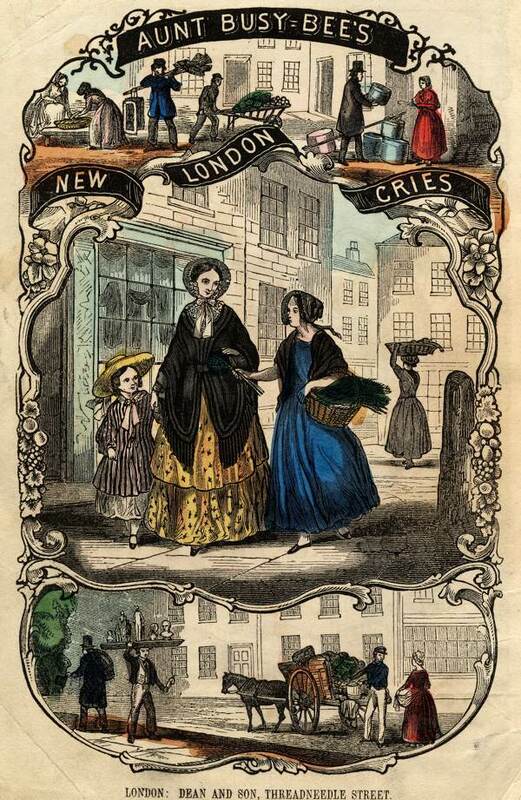 With the Cries of London, there is always a story behind each of the portraits and Aunt Busy Bee’s New London Cries from the nineteenth century, hand-tinted and produced in a pamphlet with a blue paper wrapper for sixpence, engages the readers with rhymes that complement the pictures and invite respect for the hawkers. 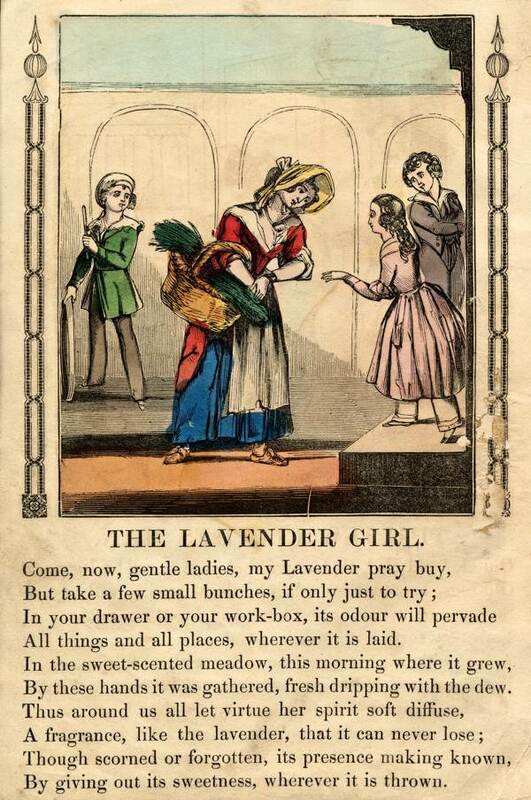 The middle class woman in the frontispiece leading her daughter down the street shows deference to a Lavender Girl in a dress stained with mud around the hem, and this pamphlet can be read an interpretation of the lives of the traders for the mother to read to her child. 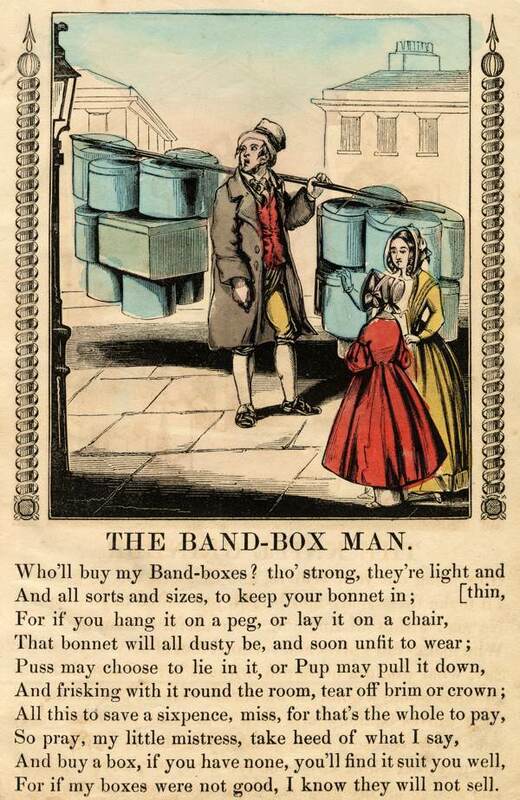 The Band Box Man is selling the hat boxes that are product of his cottage industry, manufactured at home and sold on the streets, while the Lavender Girl walked into London carrying the lavender she picked that morning in the fields. 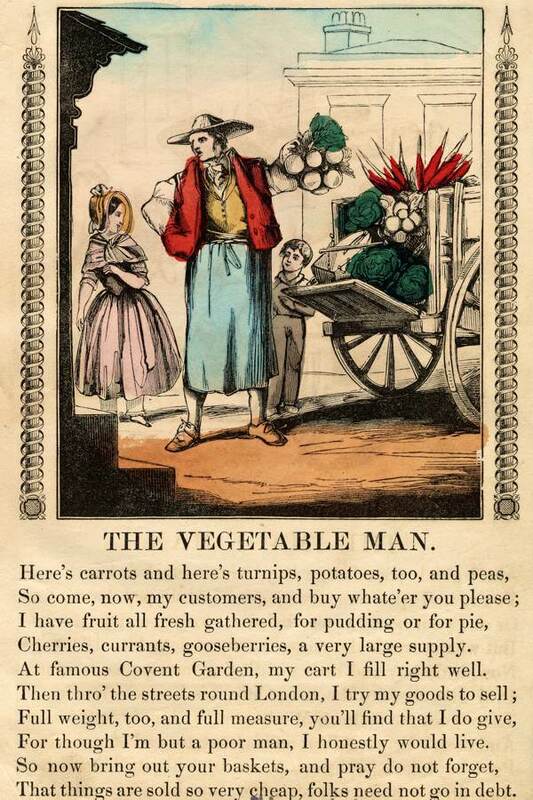 The Vegetable Seller is pursuing a trade as a Costermonger, buying his fruit at the wholesale market and hawking it around the street, as many once did at Covent Garden and Spitalfields Markets. 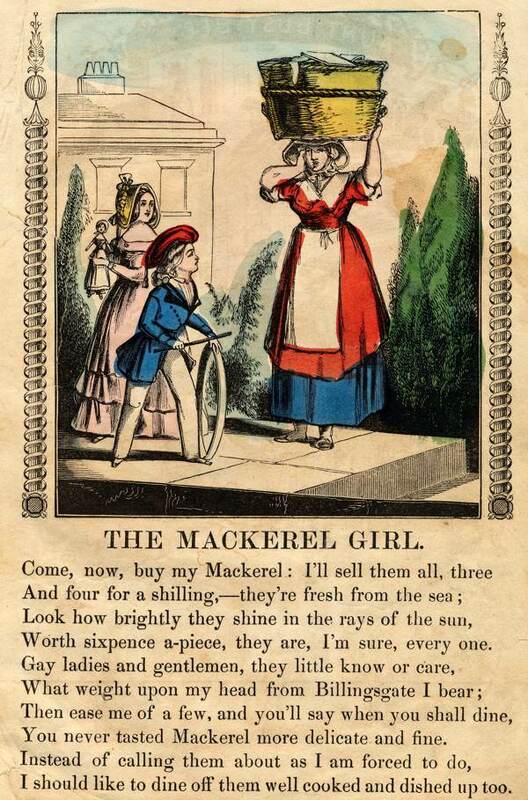 And we are reminded that the Knife Grinder provides a public service in the home and workplace, while the Mackerel Girl has no choice but to carry her basket of fish around the city from Billingsgate, which she herself may not get to eat. The mishap of the Image Seller, in comic form, even illustrates the vulnerability of the street seller who relies upon trading to earn a crust and the responsibility of the customer to permit them a living. 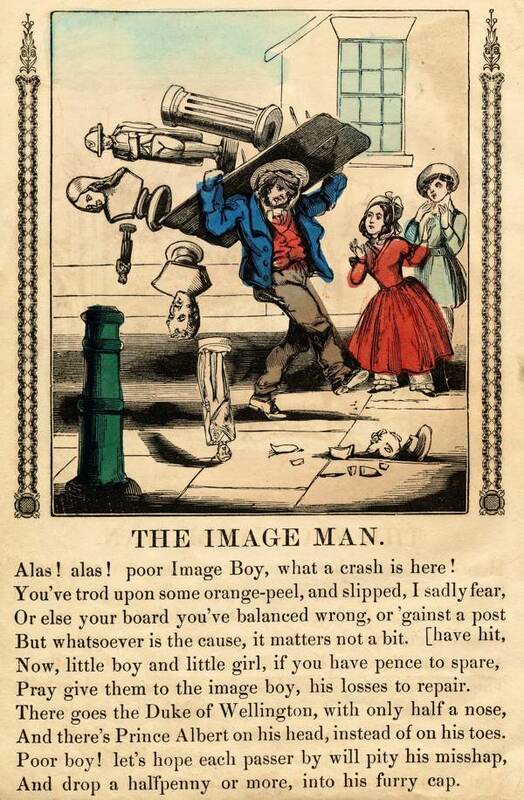 For hundreds of years, popular prints and pamphlets of the Cries of London presented images of the outcast and the poor, yet permitted them dignity in performing their existence as traders. 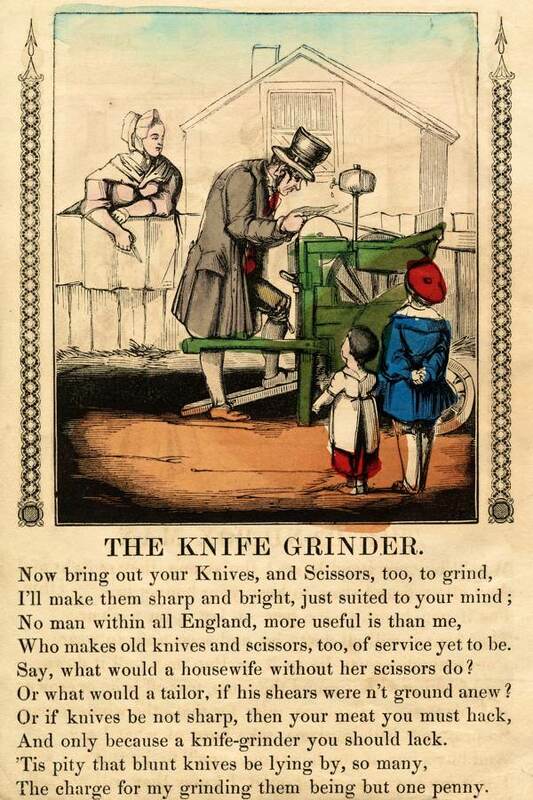 The Cries of London celebrate how thousands sought a living through street-selling and, by turning it into performance, gained esteem and moral ownership of the territory – both transcending their economic status and creating the vigorous culture of street markets that persists to this day.